Home › Elections › Should I vote for UKIP on Thursday? Should I vote for UKIP on Thursday? If I was to base my predictions for the results of Thursday’s European elections on the number and size of political campaign posters and hoardings I see on my journey to work,UKIP would on for a landslide victory. Despite the constant drip-drip of stories UKIP candidates’ politically incorrect and occasionally racist comments – of which yesterday’s ‘My rivals should be hanged for treason, says Ukip candidate’ is the latest example – there appears to be nothing that will curtail their march towards political significance and a potentially humiliating victory over the big three parties this week. It’s not that long ago that European elections weren’t even as interesting as local ones. They have been little more than a chance to gauge the level of public satisfaction with the governing party. European politics has never engaged the British public in any meaningful way beyond being a source of occasional irritation and bemusement and making us increasingly adamant that having anything to do with the Euro would have been a disaster. We tolerate the EU because we can see some economic benefits, but that’s about it. If we ever reach the point of having a full-blown in/out referendum, it’s going to be an almighty challenge for politicians to persuade vast swathes of the British public that staying in Europe is worth it. 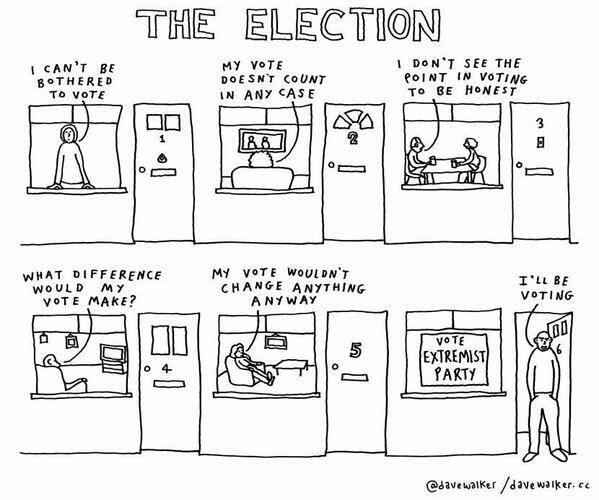 How many of us think that our votes in the European elections will make a visible difference? The parties who perform well will bask in their moment of glory for a short while, but would we notice any real difference in terms of how we see the European parliament functioning if any party swept the boards? So whereas the voter intentions for next year’s general election currently put UKIP support at around 13 per cent, for the European elections it is double that. What’s more, a ComRes poll this weekend found that UKIP supporters are far more likely to bother to make the trip to the polling stations this week than Labour or Conservative voters. There is a genuine chance that the British public will give UKIP a historic victory and in the process stick two fingers up to the EU and the other British parties. What Nigel Farage has been so adept at doing is tapping into widespread fears about immigration and a loss of Britishness as the EU appears to gradually erode the Government’s control over our own laws. Then there is the dissatisfaction over the way the main political parties are conducting their business with apparently scant regard for the views of the voters who put them into power in the first place. Party leaders and their MPs, are regularly seen to be callous career politicians, coming from privileged backgrounds and appearing far more interested in their own political maneuvering than serving their constituents. Even Ed Miliband during an interview on this morning’s Radio 4 Today programme said that he fully understood why the public is ‘deeply disillusioned’ with the current political system. Farage, in contrast, has mastered the art of portraying himself as a rare breed of politician who is straight talking, publicly putting into words what many of the electorate think and addressing their concerns head on. The problem is that these concerns and opinions are built on a great number of false assumptions. To put it bluntly, we as the British public en mass, are an ignorant bunch of people. According to an Ipsos Mori poll from last year, British public opinion is repeatedly off the mark on issues including crime, benefit fraud and immigration. It found that the public think that £24 of every £100 of benefits is fraudulently claimed. Official estimates are that just 70 pence in every £100 is fraudulent – so the public conception is out by a factor of 34. Also some 31 per cent of the population is thought to consist of recent immigrants, when the figure is actually 13 per cent. Even including illegal immigrants, the figure is only about 15 per cent. On the issue of ethnicity, black and Asian people are thought to make up 30 per cent of the population, when the figure is closer to 11 per cent. One more notable figure is that 26 per cent of people think foreign aid is in the top three items the Government spends money on. This is wildly out – it actually makes up just 1.1 per cent of expenditure. This sort of misconception gives UKIP’s call to cut foreign aid a popularist legitimacy. There is a question though of how many people, UKIP voters or otherwise, actually have any idea what their policies are beyond immigration and Europe. According to yet another YouGov poll from this weekend, over 60 per cent of the public say that they have no idea about a whole raft of UKIPs policies. There are plenty of us who have an incredibly limited understanding of what UKIP stands for and yet we would still rather vote for them this week. So what does this all mean for someone like me who as a Christian feels compelled to vote, but wants to use their ‘X’ wisely? It’s worth saying that despite UKIP’s extensive and varied flaws, they may just be what our political system needs at this time. Challenges to the status quo sharpen thinking and expose the failings in the system. One (not so) young upstart has the main parties severely rattled. Nigel Farage breaks the mould and is causing the other politicians to re-evaluate the way their parties engage with the public. We could do with a few more politicians, especially at the top, in all parties who are willing to stir things up and break new ground. Sadly the negativity shown towards UKIP and Farage by the main parties worryingly shows up their inability to find a constructive response and give the voters good reason to place their allegiance on Thursday elsewhere. Voting for UKIP is not a sin, but when the intensely eurosceptic Sun Newspaper starts writing editorials accusing Nigel Farage of being a racist then that should start to raise alarm bells amongst even UKIP’s most ardent supporters that they continue to show little sign of being mature enough to represent us with sufficient decorum and sense as our biggest party in Europe. It has never been the intention of this blog to tell readers how to vote. Instead the aim is to encourage informed understanding of the issues of the day and respond accordingly. Jesus said of himself that he is ‘the way, the truth and the life’. Christians are called to be truth seekers – to find and expose it and to fight against deception and lies. If for example we see the tabloid press stirring up prejudice that has little if any foundation against immigrants, it fully deserves to be addressed and countered. Truth cannot be found in ignorance and the least all of us – and especially Christians – should be doing is going to the ballot box with an informed opinion. There are enough good resources available that allow us to do that without a great deal of effort. Andy Walton from the Contextual Theology Centre in London has written an Idiot’s Guide to the European Elections. CARE are a Christian organisation who work in politics and have a branch based in Brussels. They have launched an incredibly helpful European election website. The Evangelical Alliance has an European elections page too. So how will I vote on Thursday? Jesus calls us to be shrewd as snakes and as innocent as doves, i.e. both discerning and wise, as well as innocent and blameless. The important thing is that I go to the polling station, having done a bit of homework and am able to place my mark with a clear conscience. We would do well to encourage each other to do the same. UPDATE: Jonathan Arnott, the General Secretary of UKIP has responded to this piece in a guest post here. I would take issue with your comment about UKIP taking advantage of people’s prejudices against immigrants. I would agree that this prejudice exists in some areas of the country and that this would influence people to vote UKIP because of what they say, but I think we need to be very clear in accurately representing what UKIP say on this matter, and others. The 3 “main parties” have declared that UKIP are racist, xenophobic and anti-immigration, but this is categorically untrue. They are, however, against not being able to control immigration. Does this make them racist? No, it means that they want to be able to say when the country cannot cope with an more people coming in to it. How is this different? Well, imagine that you run a building and you are told that you have to be open to everyone, no matter how many. And imagine that the building can fit 200 safely before it becomes a health and safety risk. If you have 250 people in the building and a fire breaks out those extra 50 people could end up causing problems evacuating, potentially leading to some deaths. In the same way, our country can only support so many people before the system can no longer take the strain. That system includes benefits, the NHS (and other state-funded institutions), roads, housing, policing (basic maths tells us that with more people will come an increase in crime, even if the percentage per person remains the same) and so on. And yet, under EU rules we are not allowed to turn away anyone who is from an EU member state. Now, I would not be surprised if some reacted to what I have said by either questioning it’s accuracy or telling me it is still racist, because people seem to be prone to telling someone that disagrees with them on some key issue that they are expressing hate (note the presence in the debate from all the other parties of words ending in “-phobia”), and sometimes (as has been shown) this can be correct. But there is no way that it can be correct to the extent that they would have us believe. If you really believe that their policies on the EU are based on a fear/hatred of foreigners then fine. But if they are actually just sincerely held beliefs that you don’t agree with, please be appropriate with your language rather than inflaming the argument. I agreed with all that you said except in your talking about crime / policing; in reality the extra cost of policing generated by immigration is relatively small, and to mention it at all is to give a sour taste to an otherwise well argued post. Sadly politics is all about spin, and giving emotionally engaged an excuse to reject the logical is a mistake. I am not arguing that immigrants bring crime, just that people bring crime and the more people there are the higher the number of crimes, even if the percentage remains the same. It is basic numbers, nothing else. It could be that the increase in crime would be all done by Anglo-Saxon residents (for want of a better term), but it is still an increase that will naturally occur due to the increase of the population of the country. The British historically do not like foreigners, end of. UKIP are only saying what the majority of British people think but are too afraid to say for fear of political correctness gone mad. Except that they aren’t saying it. they are saying the opposite (apart from a few members, who are not espousing the official party line). It is nothing against individuals or national groups, it is about truly controlling the borders. Given that Farage has a German wife, the simplistic allegations of merely being anti-foreign fall away! Thanks for the quick response! Even the Lib Dems agree that we need some border controls, so to cap immigration or vet who is allowed to take residence here is absolutely not racist. As a party it can be argued that the BNP are racist, but UKIP do not fit into this category as a party. They certainly have some members and candidates who have made racist remarks, but all parties have unsavoury, unlikeable candidates. Consider those MPs who have been convicted over parliamentary expenses for example. The frustration with this election is that immigration and the treatment of foreigners is predominantly the topic of conversation for UKIP and Nigel Farage. This is partly because they keep getting asked about it, but they show little interest in moving the conversation on and are quite happy to use statistics to fuel distrust on this subject. But part of the problem is that not only are they asked about it, but the “main 3″ also spout inaccuracies about UKIP’s views on immigration and foreigners all over the place, so there is a lot of UKIP (Farage in particular” being reactive because of what is out there, rather than proactive with UKIP’s message. There is also the fact that UKIP are like the LibDems were before the 2010 election. They have their main theme for speaking out on, but the rest of their policies are often not well thought through and thus open to change. And when they do change, either because they have had a rethink or because they have taken new information into account, they are ridiculed for making a “u-turn”. So it is often far easier to speak on the message that remains the same than talk about the stuff that either people don’t want to hear or has the potential to opening them up to ridicule by the political elite. I agree. The main parties feel threatened and are happy to do what they can to put UKIP in a bad light, but this tactic is doing more to reinforce the public’s mistrust of them. UKIP are riding the storm without any great casualties judging by the opinion polls. Yes. I agree. In fact I would go so far as to say that is one of the only pragmatic reasons to vote – to please our consciences (which, incidentally are unlikely to be pleased (as usual)). Because it is a case of having to vote for the least of all evils. Where are the eurosceptic parties who are pro-immigration? They don’t exist. 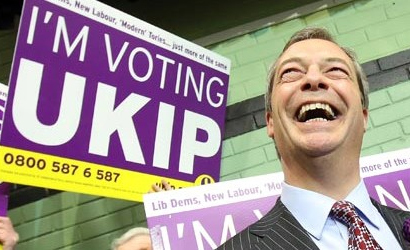 Where are the pro-immigration parties who are eurosceptic? Not all eurosceptics are anti-immigration. Some Christians even have open door stances. Why is a belief in self-determination and the independent sovereignty of a country bound up in anti-immigration stances? Pragmatically I believe that the only other reason to vote is to have something to talk about with God in prayer. Voting just isn’t effective. UKIP may paint themselves as some kind of ‘thunderchild’, a national hope, but they are not effective either. They have not been able to secure a referendum. They only have a lobbying power. Britain’s power within the EU is minimal. We don’t even get a choice on the European Commissioner – the top job in Europe. Are the Christian parties such a bad choice – at least they could probably be trusted? Call this a deal with the devil, but the only way I can see what remains of Britain withdrawing from the EU is with a Tory Government (who have promised a referendum in 2017). Britain does have the right to leave the EU but no country has ever done so. If you are eurosceptic for reasons to do with Bible prophecy (and not just the endemic corruption which is said to exist in the EU) then withdrawal could be worth fighting for, depending on whether you think it is fate for Britain to be part of Europe or not. I forgot to add that I won’t be voting Tory. Nick, I’d say that the closest you’ll get to a Eurosceptic pro-immigration party is the Greens. Whilst my party doesn’t want to pull out of Europe, we think it needs radical reform to be truly fit for purpose, and we do support the idea of holding an in-out referendum. Of course, you are right that these elections are unable to give us a referendum on Europe. Although this time round it is expected that the president of the EU commission will be the nominee of whichever pan-European Party gets the most seats across Europe. And all of the significant British parties belong to one or other of the European parties. Ok, so I’m immediately biased on the basic question as a long standing supporter of another party, so my obvious answer is no don’t vote UKIP. I recognise many of the points that you raise Gillan about the changing nature of the political landscape in the UK especially in respect of disenchantment, disappointment and disengagement and the widespread frustration felt in the response by the ‘mainstream’ political parties. However, in this instance I do think that we must be prayerfully mindful of the changes that are taking place across the wider European political space – ironically – and note the rise of right-wing populist parties in many nations including Denmark and the Netherlands. We do not know what the outcome of such shifts will be or whether this is just a temporary phenomenon and I have no prophetic insight into the future on this front but it does no harm to keep an eye on the bigger picture every once in a while. I think the real problem with voting UKIP in the European Parliament elections is that you are electing MEPs, whose job is to improve European law, and UKIP MEPs have a very long track record of not even trying to do the job. Wherever you are on the political spectrum, you’re far better off voting for one of the other parties that can realistically win seats (Labour, Conservative, Liberal Democrat, Green, SNP, Plaid Cymru), because their MEPs will at least try to ensure that new EU legislation is improved (though obviously their definition of what makes for better EU laws differs from each other).